The South African National Museum of Military History, known as the South African National War Museum until 1974, was opened officially on 29 August 1947. Its collections were, however, first opened to the general public some years earlier during World War II. Over the 60-plus years of its existence, the Museum has accumulated an impressive collection of aircraft, armour, artillery, small arms, medals, badges and uniforms. 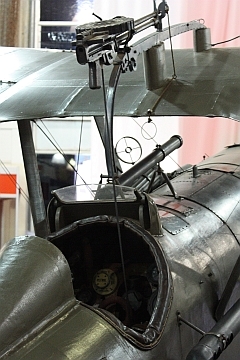 Today, the National Museum of Military History houses 14 complete aircraft, including many from the World War I and II era, and various parts and engines from other aircraft. This is the largest collection of aircraft from the earlier period of military aviation in South Africa, which includes a rare surviving example of the world-famous Me262 jet aircraft. The Messerschmitt Bf109 was the backbone of the Luftwaffe throughout the Second World War (1939-1945). 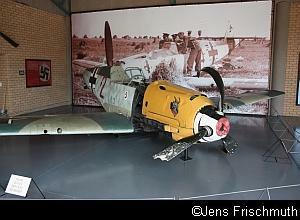 Over 33500 Bf109 of various marks were manufactured and flown in fighter-bomber roles. The Messerschmitt Bf109 E3 owned by the Museum was flown by Unteroffizier Hans Wolf on an operational sortie over the south-east of England on 28 November 1940 and seems to have run out of fuel causing it to make a forced landing on a farm at Udimore, Sussex. It was sent to South Africa to appear in a travelling exhibition of enemy equipment during the war, after which it was presented to the Museum in 1944, being one of the first items in the collection. The Focke Wulf FW190 was one of the finest fighter aircraft used by the Luftwaffe. 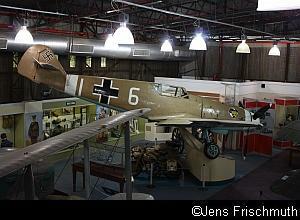 The Museum's Focke Wulf FW 190A-6/R6 was captured by the British at Leck-Holstein in Germany. It was flown to England and its original flight instruments were replaced with American and British equipment. The plane was shipped to South Africa in October 1946, where it ended up at the Museum. 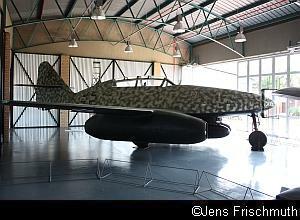 The Messerschmitt Me 262B-1a/U1 of the Museum is a two seater trainer version of the world's first turbo-jet powered aircraft to reach operational status. Fifteen of these trainers were converted to radar-equipped night fighters to combat the fast-flying Mosquito bombers of the RAF. This aircraft is the sole survivor of these 15 night fighters. It operated in the final defence of Berlin in April and May 1945. At the end of the war, "Red 8" was moved to Denmark to prevent it falling into Russian hands. It was later handed over to the Royal Air Force and flown to the United Kingdom for evaluation by the Central Fighter Establishment. It arrived in South Africa in 1947. The most famous British fighter aircraft of the Second Word War, the Spitfire came to fame during the Battle of Britain in 1940 in its partnership with the Hawker Hurricane. Over 20 variations of the original design were produced and the Spitfire continued to serve with many air forces into the 1950s. The Museum's Supermarine Spitfire Mark FVIII was a high altitude version with extended wingtips and was fitted with a tropical air filter on the carburettor for operation in hot and dusty climates. This aircraft was built in 1942 and came to South Africa at the direct request of Field Marshall Smuts for a special exhibition in 1944. The Royal Aircraft Factory Scout Experimental 5a (SE5a) was one of the greatest British combat aircraft of the First World War (1914-1918) and was flown by many of the most famous pilots of the Royal Flying Corps. A total of 5200 were built. This particular aircraft was built in 1917 and came to South Africa as part of the Imperial Gift of aircraft in 1919/20. A complete restoration was carried out between 1990 and 1997 and it is one of only six remaining in museums throughout the world. Since it was not intended that the aircraft would ever fly again, damaged structural parts were repaired instead of replaced to retain as much as possible of the original material. The port side of the fuselage was left uncovered to allow visitors to see the construction of the aircraft. The Messerschmitt Bf109 F-2/Trop was captured at Maple Arch in the Libyan Desert by No 7 Squadron of the South African Air Force in 1942. It was captured in damaged condition and repaired by the SAAF using parts from other captured German planes. This Bf109 is painted in a desert colour scheme and is fitted with a special air filter to protect the engine from sand and dust. The De Havilland DH-9 was built in 1917 and came to South Africa as part of the Imperial Gift in 1919. The DH-9, a ground attack and reconnaissance aircraft of the First World War, had a poor record as a combat aircraft due to lack of performance. However, it played an important role in the early development of commercial and private aviation in South Africa and in the establishment of an air mail service between the major cities. The De Havilland DH-98 Mosquito was a fast-flying British bomber used during World War II. 7695 were built and served with 15 foreign air forces, as well as the RAF. Built for speed and kept light through the extensive use of wood in its construction, the Mosquito was the fastest military aircraft in the skies prior to the introduction of jet-powered aircraft. The Museum's De Havilland DH-98 Mosquito is a photo reconnaissance Mk IX built in the latter half of 1943 and was given the RAF serial number LR 480. After serving for 3 months with the RAF, it served with No. 60 photo reconnaissance squadron of the SAAF on operational flights over Europe. 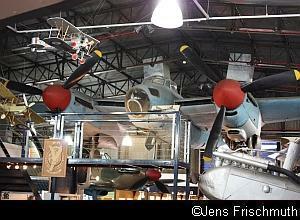 In December 1944, it was used for a speed record attempt for a flight from Cairo to Pretoria. This flight ended in disaster when the plane went into a ditch at the end of a too short runway at Que Que (then southern Rhodesia). Extensive damage to the undercarriage and propellers took 20 months to repair. Once repaired, it was flown to Pretoria in August 1946 and placed in storage at 15 Air Depot until being presented to the Museum in 1948. Its total flying hours were 219. 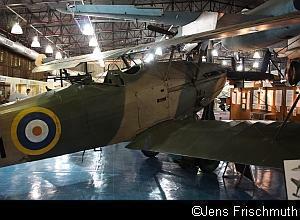 The Hawker Hartbees, a light bomber of British origin and a modification of the Hawker Hart, was one of the first military aircraft to be built in South Africa. Hartbees aircraft saw service with No. 40 Squadron of the SAAF in the East African and Abyssinian campaigns of 1940/1 before being replaced by more modern aircraft. 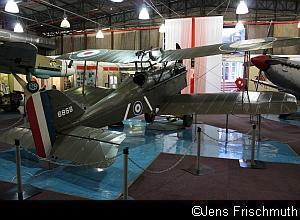 The Hartbees is the only South African-built aircraft in the Museum and is one of 65 of these aircraft assembled at No 1 Air Depot, near Pretoria, prior to 1939. The Museum's aircraft is the only surviving Hawker Hartbees. The Hawker Hurricane Mark IIC, RAF serial LD619, was manufactured in England in 1943. It was sent to North Africa by the RAF but it was not allocated to an operational unit. 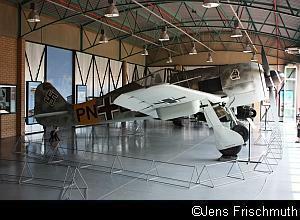 The plane was transferred to the South African Air Force in April 1944 and its serial was changed to 5285. It was used by No.11 Operational Training Unit in South Africa. 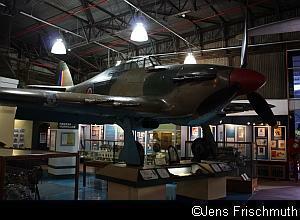 The Hurricanes were retired by the SAAF after the war and the plane was donated to the Museum in May 1950. The Museum's Aermacchi/ Atlas MB326KC Impala, a Mark II single seater with serial number 1045, was constructed by Atlas Aircraft Corporation (now Denel) in Kempton Park and was taken on charge at 15 Air Depot on 6 September 1977. It was allotted to No 8 squadron and on four occasions between 1979 and 1984 was detached from the squadron for use in the operational area on the Namibian/ Angolan border. The Impala subsequently served with 4 Squadron based at Lanseria Airport before being transferred to No.85 Combat Flying School, where it spent its last years of service at AFB Pietersburg (now Polokwane) before being donated to the Museum. The Dassault Mirage III is a supersonic fighter designed in France in the 1950s. 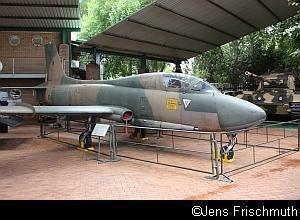 A total of 58 were received by South Africa from 1963 onwards and served with the SAAF for about 25 years. 26 were converted to Cheetahs from 1986 onwards. The Museum's Mirage III CZ, serial number 813, was allocated to Major Bob Crinall of No.2 Squadron for his use and which he flew in ground attack operations on the Angolan border. The Mirage arrived at the Museum on the 10th of May 1992. The Hawker Siddeley Buccaneer S.Mk 50 was once considered to be one of the finest low-level bombers ever designed. It was brought into service with the SAAF in November 1965 and a total of 15 served with the air force (one of the 16 ordered was lost on its delivery flight). They remained in service until 1990 but by then, only five survived as the Buccaneer had a high attrition rate. 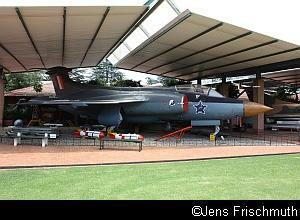 The Museum's Buccaneer, serial 422, underwent a major overhaul costing many million rand in about 1987-89. It is rumoured that 422 was the Buccaneer earmarked to deliver the South African nuclear devices which were manufactured during the period 1980 to 1988. 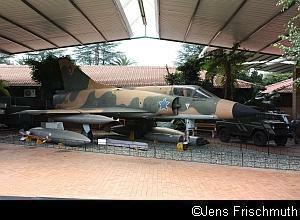 The Buccaneer arrived at the Museum with the Mirage IIICZ on the 10th of May 1992. The latest addition, a Douglas C-47 Dakota, SAAF serial number 6850, arrived at the Museum on the 6th of April 2009 from Emperor's Palace near OR Tambo International Airport, where she hung from the roof of the entertainment centre. Restoration will take about a year - then she will be placed on permanent static display. 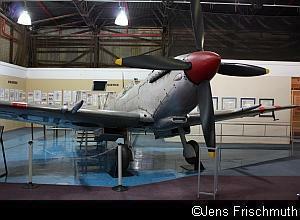 More information can be obtained from the Museum's website, www.militarymuseum.co.za . 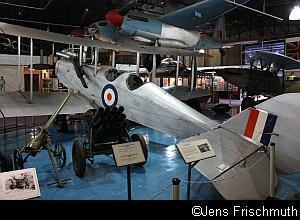 Below is a photographic record of the aircraft on display.